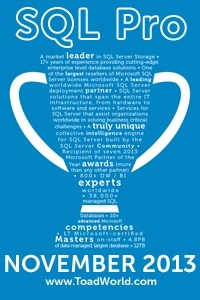 It is T-SQL Tuesday again and this month we are taking the road less traveled. Michael J Swart (b/t) has asked us to “Argue against a popular opinion”. Now I do have a concern about this subject. I am frequently sarcastic and frequently people don’t realize this. So I’m going to start with this. And this post is sahr-kaz-uhm. Later today, in a week, in a year, when someone comes to me and says “I can’t believe you wrote …. ” I am going to point here and say “sahr-kaz-uhm!”. SQL Server has an amazingly helpful community. There are dozens or even hundreds of bloggers, numerous forums where you can ask questions of others and free training everywhere. But this is a competitive world and the goal is to get yourself a good job and keep it. For each job there are dozens or even hundreds of applicants of which you are only one. Do you really want to give your competitors a leg up? I know I don’t! Steve Jones (b/t	) will tell you that you should blog and create a brand for yourself. But then he was one of the founders of http://www.sqlservercentral.com and made a career for himself helping others and helping people help each other. You are not Steve Jones. Grant Fritchey (b/t) is known for his skill at performance tuning and has written several books on the subject. He teaches classes at community meetings and will happily answer questions (no matter how fierce the Scary DBA seems). But there is a price to all of this. Imagine Grant has just interviewed for a new job and the interviewers are discussing whether or not to hire him. The conversation might go something like this. “Wow Grant Fritchey, he’s really well known!” “Yea but that means he’s going to want a lot of money.” “Well true. You know, he’s written all those books. We could just hire someone cheaper and have them read his books, maybe go to one of his training classes.” “Not a bad idea. That would probably work.” Sorry Grant, no job for you! Adam Machanic (b/t) has a similar problem. Not only does he blog but he created the amazing tool sp_whoisactive and now rather than hiring Adam a company only has to hire a DBA who can run sp_whoisactive and read Adam’s blog. Much cheaper! The folks at Brent Ozar Unlimited (b/t) are the worst! They are a boutique consulting firm that gives a weekly webinar called Triage Tuesday, have created numerous tools such as sp_blitz and blog constantly. Now think about this, they are a “Consulting” company. They make money by fixing other people’s problems! So what happens when they give people the tools to fix their own problems? And do it for free no less? They lose money that’s what! Sarcasm ending. Have a nice day! « Characters you should never ever use in an object or schema name!